Our therapist, Bec Shelton, was lucky enough to attend the International Society for Augmentative and Alternative Communication (ISAAC) Conference on the Gold Coast in July this year. The ISAAC conference was a 4 day conference sharing the latest research and trends in AAC technology, intervention and awareness for AAC users, parents, teachers, support workers and therapists. But what is AAC? AAC stands for Augmentative and Alternative Communication, and is a term that basically means any communication that isn’t spoken (e.g. sign language, speech generating devices, picture based systems). Have a look at our AAC blog for a bit more on this topic. Speech Pathology Australia suggest that their are about 1.2 million people in Australia living with a communication disability, and about 85,000 of these people use some sort of technology to get their message across. Project Core is an ongoing project out of the US, which aims to teach communication through ‘Core Words’ (the 200 or so words that make up 80% of what we say everyday). They have a significant amount of materials available for free on their website, including research and online modules to learn more about using Core Words to teach communication and literacy. Their professional development modules on Core Vocabulary are short, online videos which cover 12 different topics from an overview of Project Core, to teaching independent writing to AAC users. They also have lots of free universal core boards in different sizes and symbol types. An Australian team are currently developing the ‘Roadmap of Communicative Competence’ (ROCC) – a resource for schools and teachers to develop individual student learning goals and monitor progress of AAC users in their classrooms and schools. While the ROCC isn’t complete yet (due for completion in November), you can sign up for notifications and to learn more at their website. 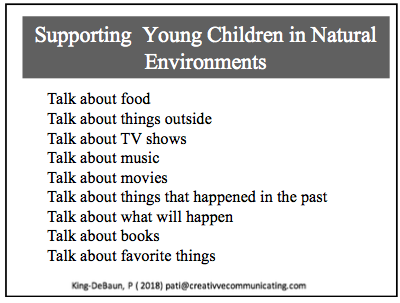 In Pati King-DeBaun’s session on supporting authentic voice in AAC users, she discussed the purpose of communication across our lifetime, and that “social interactions remain to be the most consistent purpose of communication”. She reported on the importance of modelling and that communication partners should model an AAC across the day and across environments, and not just in structured activities. She explained that “students make stronger connections when they are given real purposes for their communicative efforts” and that conversation should be encouraged by developing interests and hobbies and showing interest in what a student is involved in. Bethany Diener from Tobii Dynavox, presented an interesting seminar on using a client’s interests in therapy. About 60% of what we say in a conversation relates to ourselves or things that we’re interested in. By using items of interest, we can increase a child’s motivation in using their AAC. This increased motivation can lead to an overall increase in their functional communication. Have a read of our Playing Games with AAC for some more ideas on using games and a child’s interests when starting out with AAC. Head to the ISAAC website where you can download the presentations from the conference. While you’re there, why not have a look at the finalists from this years ISAAC short film festival. Have a read of our blog for more about AAC and using AAC in play.